The Tick is a really funny cartoon series. The short lived live-action series was funny as well, but not nearly as much because in the live-action series, they couldn't really do anything. 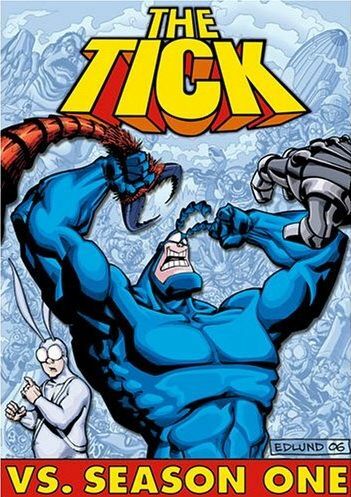 Think about it, the Tick is an insanely strong superhero who does almost as much damage as the bad guys he's trying to stop... so for a 30-minute long live action TV series, that would cost a whole heck of a lot of money. Thus, most of the live-action series consisted of talking... just talking. 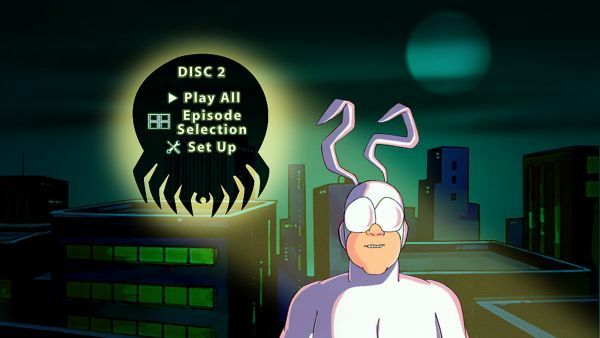 The animated series, on the other hand, can not only included the hilarious entertaining dialog that makes the Tick universe such a joy to experience, it can also execute all sorts of crazy action sequences that would cost a fortune to do on a backlot TV set, from weird supervillain schemes to having the Tick leaping across rooftops (and causing structural damage each time he lands). So if you want the full Tick experience, this cartoon series is the way to go. The series starts with Episode 1 (what... are you serious?! No way! ), where Tick crashes a super hero convention, where a panel decides which superhero will be assigned to protect which city. After the Tick makes an explosive first impression, the panel assigns him protector of "The City". Soon after his cramped bus ride arrives in "The City", he begins patrolling and ends up crashing into guy wearing a moth costume. This strange fellows goes by the name of Arthur, and until today, he had been a mild mannered accountant. But Arthur decided he couldn't live that life anymore. He needed action and adventure, so when he was fired from his job for wearing that moth costume, he embraced the change, eager to make his destiny happen! Well, needless to say, Arther is excited to join the Tick in his quest of justice-ness, and the Tick is happy to accept the superhero wannabe as his sidekick. So the pair team up to protect the city from all the weird and wacky supervillains out to do it harm! Ah, but "The City" also has several other superheroes intent on protecting her, such as American Maid, Deflator Mouse, Caped Chameleon, Sewer Urchin, and many more. Is this town big enough for all these protectors? Heck, is it even big enough just for the Tick? I suppose the answer to that rhetorical question doesn't really matter, since laughs prevail regardless! 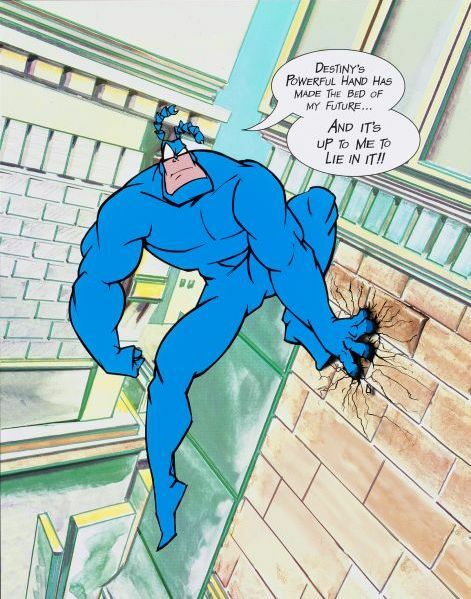 The Tick Vs. 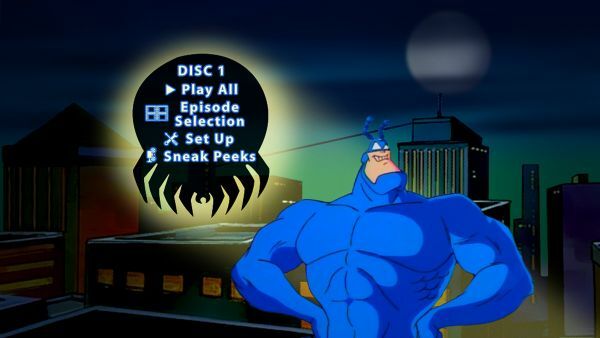 Season One contains 12 out of 13 episodes from season 1 (and again, this is the animated Tick series, not the live-action series). 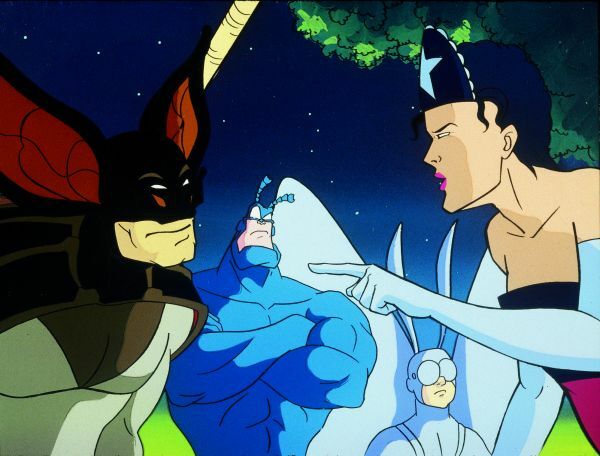 Unfortunately, poor old episode 11, The Tick vs. The Mole Men, has been left out for some reason. Apparently, Disney claims it was left out for "creative reasons", but I've read that some speculate the cause to be simply that Disney just couldn't fit 13 episodes onto two discs, so they picked that episode to leave off as many consider it to be the weakest episode of the series. I don't remember the episode, so I can't say whether or not I agree with that opinion of the episode. The thing is, I couldn't imagine what kind of creative reason Disney could have for not including it, but then... I'm not sure I believe the speculation either about not having enough room either. One only has to look at the discs to see why. Disc one contains 8 episodes with a total running time of 167 minutes, while disc two contains only four episodes with a total running time of 85 minutes, and they're both single-sided discs, so it seems to me like there is plenty of room for one more episode. Well, whatever the reason, the missing episode didn't hinder my enjoyment of this collection. And now lets move on to the special features... hm... hold on sec, I'm looking... well alrighty, it looks like there are no special features. Okay, that was easy. At least they didn't try to claim "full screen" as a special feature like Teenage Mutant Ninja Turtles - Volume 5. But really, I don't mind the lack of extras, as this two-disc set does profile 252 minutes of Tick goodness (well, a little less if you take off the opening and closing bits of each episode). I was disappointed to find that I couldn't chapter skip past the opening title sequence. Why is it so hard not to put those in for some releases? It's not like chapter breaks take up any extra room. Episode 11 is crossed out because, as stated earlier, it is not included. The Tick Vs. Season One was released by Buena Vista Home Entertainment on DVD starting August 29, 2006.